This is an inexpensive, no-frills hotel. It is perfect to sleep in after a day of enjoying the city. I have two time shares in Manhattan, much better accoutrements. However, I prefer the St. Marks. I read a few reviews before our stay here, some negative, some positive, but after actually staying here, what a steal of a deal!! Sure the rooms are small, but it's a historic hotel in a great location in New York City! We stayed 3 nights at this hotel in one of their one full bed hotel rooms which very comfortably sleeps 2 guests. We enjoyed a private bathroom (not a shared one) and the hotel was VERY conveniently located near the 4, 5, 6 and also R, W Subway Lines which took us anywhere we wanted to be in no time at all! I absolutely enjoyed staying here and would stay here again. It's not the Taj Mahal, but for the incredible price that left us with money to do lots of fun things NYC has to offer and the comfortable room we got, with the location, location, location, it was absolutely fantastic! This hotel is in a small, funky building within a short walking distance of lots of restaurants and both Cooper Union and NYU which is why we chose it. The room was fine, if a little dated, but we really liked that the two beds had their own separate rooms and there were two bathrooms for the three of us. Biggest surprise is that they DO NOT TAKE CREDIT CARDS - very strange in 2017 :-) They do, however, have an ATM in the lobby, with (of course) a fee for withdrawal. My room became smoked filled as the night went on as someone was smoking either in the hallway or in another room and it was AWFUL! In addition, there were bugs in the room---looked like mosquitos, which is very unusual for late October! Had to pay cash which is NOT listed on the website and certainly makes me wonder why??? This stay is bare-bones, but just enough! The staff were wonderful and accommodations clean, comfortable and private. For the money and location, it's the BEST hotel I've stayed in. <3 Not for Times Square touristy travelers and anyone with mobility issues --- no elevators and everything is only accessible by old staircases. The reason I gave it at 2 overall is that they accept only cash no credit cards I did not see this listed when I booked it through Orbitz. In all honesty I may have missed that detail but the point is I have never stayed at a hotel before that accepted only cash. I had to scramble to transfer money and go to an ATM to get them the cash so I could check in. So just be forewarned its cash and carry. Also there are no ice machines on the premises. They would only take cash, no cards to pay for room. You have to take your luggage up a steep flight of stairs, no elevator. Not handicapped accessible. But the perks: located close to NYU and Lower East Side Tenement Museum and subway. Tjere are.no amenities...not even a hairdryer. If you're in town for a short stay, or not planning to stay in your room for long....this place might be for you. The experience was good, friendly and helpful staff. The room was really disappointing. It was nice, staff at the front desk seem like really nice people,very helpful. I had a nice experience. 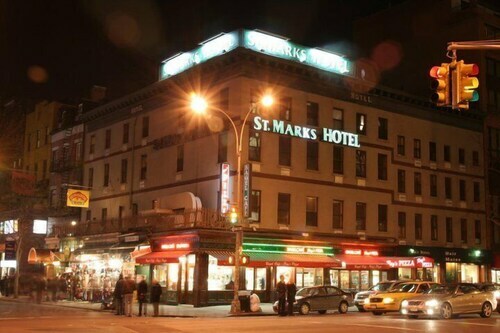 Located in East Village, St Marks Hotel is within a 10-minute walk of popular sights such as 5th Avenue and New York University. This 64-room, 3-star hotel welcomes guests with conveniences like a bar/lounge, express check-in, and express check-out. An LCD TV comes with cable channels, and guests can stay connected with WiFi. The bathroom offers hair dryers and free toiletries. Other standard amenities include free local calls and an ironing board. At St Marks Hotel, guests have access to WiFi in public areas, express check-in, and express check-out. The front desk is staffed 24 hours a day to help with securing valuables and luggage storage. This hotel also has an ATM. inexpensive, but not sure it's worth it! bare minimum, if that's what you're wanting.